It looks like you could fly the space shuttle with it! This Seiko chronograph has a stainless steel case, bezel and bracelet, and holds enough steel to build your own SUV. 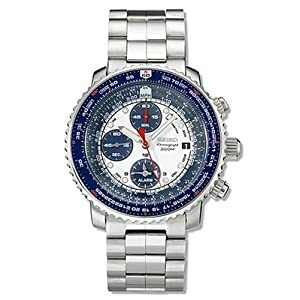 It features an alarm function and, as a chronograph, also has stop watch functionality. By "flight computer", they mean that it has a couple of bezels that you can use to do some calculations on the watch. It uses a Japanese quartz movement to make sure the time is always right. And it's water resistant to 200 meters (660 feet) - in case your flight crashes while you're playing with your watch. Great for geeks!